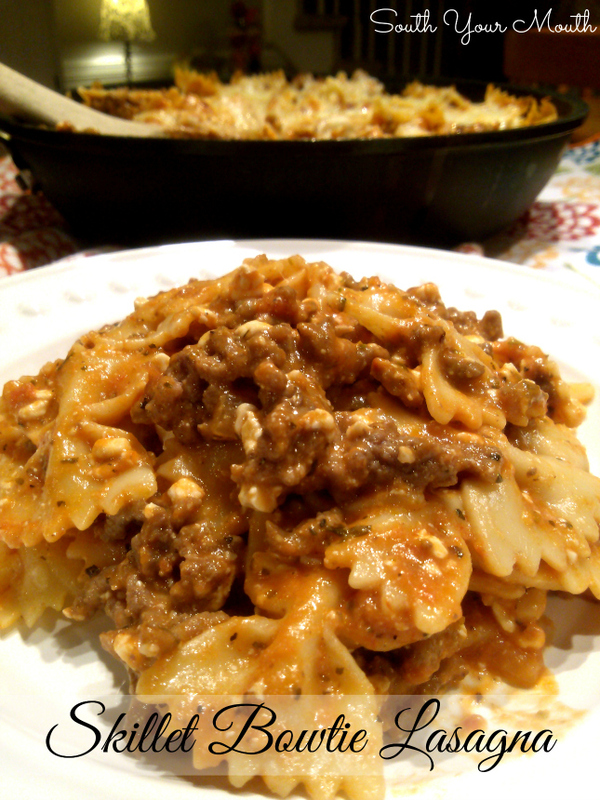 Quick and easy stove-top lasagna made with bowtie pasta. Brutus: Mama, I have to tell you something but I think you’re gonna be mad. Me: What is it, bud? Brutus: You know how I always say I love it when you cook something? Brutus: Well, that’s not always true. Brutus: Well, what I mean is… what I’m trying to say is… this is really good. But I mean it this time. I reallyreallyreally like this. And I mean it. Because I didn't always mean it when I said other stuff was good. But I really mean it now. And I want you to cook this again. A lot. But I love everything you cook. I mean, I love that you cook it. For us. But I don’t always love eating it. But I do now. With this. I really love this. And I want you to keep cooking it. This. Not all the other stuff. Well, some of the other stuff. But this mostly. Mama, will you just cook this again? Me: Good Lord, son, don’t hurt yourself. I think mama understands what you’re saying. Me: Yep. You want more broccoli and less lasagna. Me: Just kidding, bud. I gotcha. I’ll make this again soon. Bless his heart. I will definitely be making this again! My poor family suffers from the ‘are we ever going to eat this again?’ phenomenon that plagues most food bloggers' households. We’re constantly trying new dishes to post on the blog and don’t repeat ourselves often enough. But I’ll make this one again soon for a few reasons. One – because Brutus earned it. Two – because it’s delicious. And Three – because it makes a large batch and the leftovers heat up beautifully so this Sunday dinner can make an encore performance the following Wednesday and I get a night off of cooking! Brown ground beef in a large skillet over medium high heat, seasoning with salt and pepper to taste. You’re going to need a really large skillet for this. If you don’t have something 14-inches or wider, just prepare this in a large pot or Dutch oven. Drain excess fat from meat then add spaghetti sauce, garlic, salt, pepper, red pepper flakes and Italian seasoning. Reduce heat, cover and simmer until pasta is ready. Cook pasta per manufacturer’s instructions for al dente preparation in liberally salted water. Drain well then add to meat sauce. Also add cottage cheese and gently stir until all ingredients are thoroughly incorporated. Sprinkle mozzarella over pasta mixture, cover and cook on low for 10-15 minutes or until dish is bubbly and mozzarella is melted. I then put mine under the broiler for a few minutes to brown the cheese but you don’t have to. Just made this for dinner tonight - very good! I bet the leftovers tomorrow will be even better. Thanks for the simple yet very satisfying recipe! Will ricotta "melt" into sauce so you don't see any white pieces? Can you tell I have a picky eater??? It will more so than the cottage cheese but you'll still see it too. Maybe substitute 1 cup of sour cream or an 8-oz package of cream cheese. Is Ricotta a 1:1 ratio substitute for cottage?. Since Ricotta is drier than cottage cheese, I am not sure on the substitution. This looks yummy and I think my grandkids would like this one. Yes, this is plenty saucy so it won't be too dry with ricotta. I made this last night for supper, substituting cream cheese for the ricotta (no ricotta in fridge), yumminess. We have enough for supper tonight. Thanks for this recipe. excellent dish. thanks for the recipe!! it's perfect. This was so good!! I used the cream cheese since I had it on hand and my family loved it!!
. I really wish the printable option would allow the picture to print with it. if i do not use red pepper flakes will I be able to tell the difference? Dumb question--All I have on hand is penne pasta and am too lazy to run out to the store. Will that make a huge difference? Thanks, Mandy! It was interesting to see that you're from Lexington. We lived there for 15 years and LOVED it! I am new to your site and found this recipe through Pinterest. I made it for dinner tonight and it was absolutely delicious! Even my picky children liked it! thanks for sharing! I am going to use this recipe for a team dinner of 23 teenage baseball boys (ack!) I'm thinking one serving each since there will be salad, bread & other sides. Would you recommend I double, triple or quadruple this recipe? Thanks. Hello from Finland :-) Thanks for this recipe I made it for supper tonight and it was a hit so I'll be working it into my menu rotation.